Apparently third time is a charm. There were two things about this project I was concerned about being able to pull off. One it the egg crate dividers, the other is the door. Of the two, the dividers had me more concerned because they have to fit snugly into the case without any gaps. 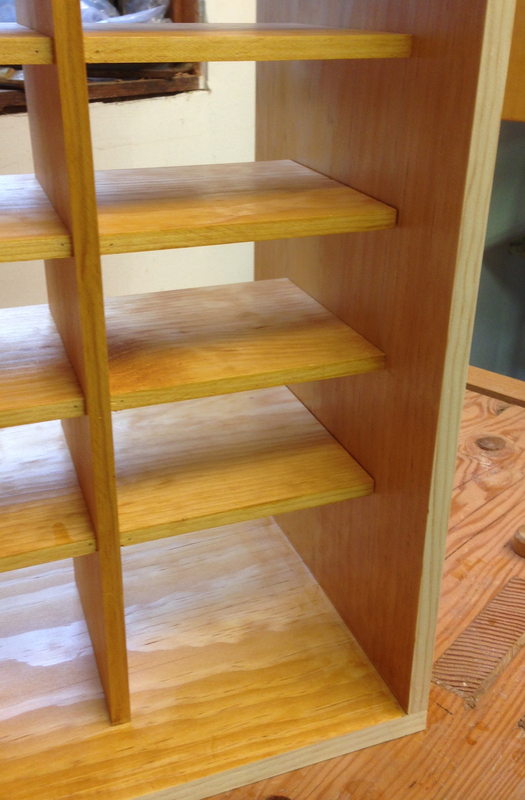 I did my best to make a square carcase, which simplified getting the dividers in. But it took three tries to get the dividers built. The first attempt I had the notches on the vertical dividers too tight and the and the “tabs” split off. Rats. No, really, that’s what I said. Besides cutting the slots too tight in the vertical dividers, I cut one of the slots too loose in the horizontal dividers (by like 1/16+). So I re-cut both slots in the horizontal dividers to the same dimension (.420″, in case you’re wondering). 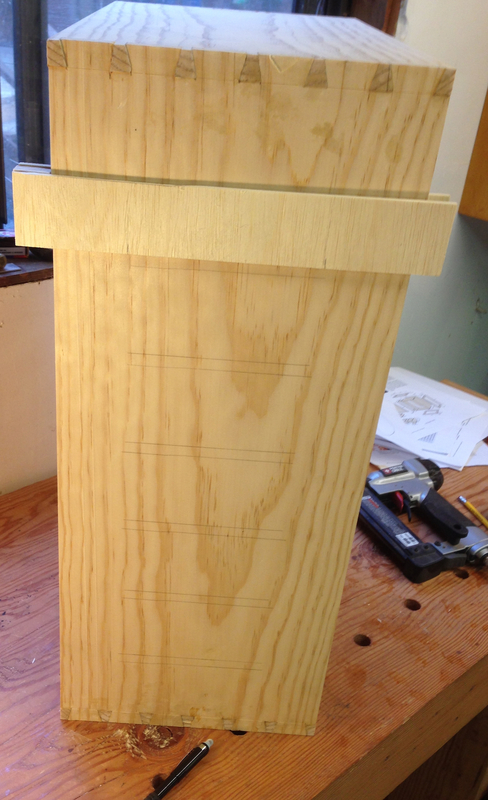 Then I machined up some stock for the vertical dividers to exactly fit the slots. 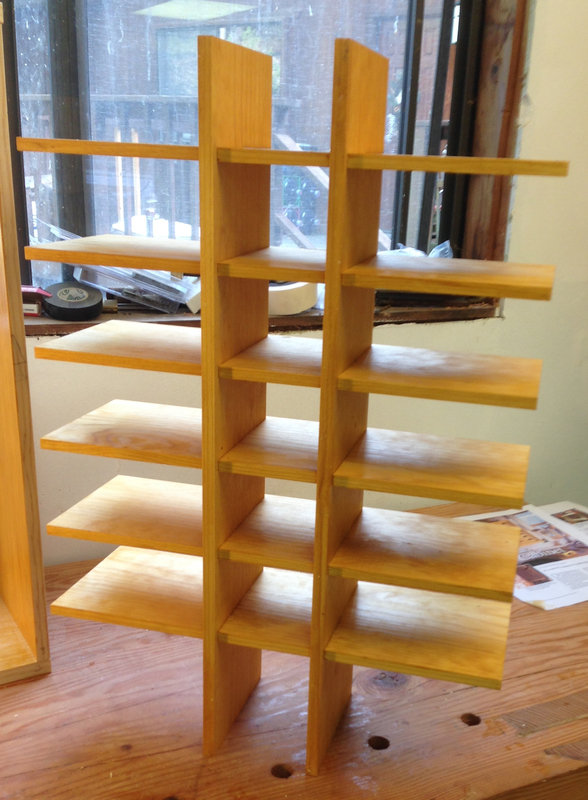 I carefully laid out each slot in the new vertical dividers, using an off cut to make sure I had the exact right width. About half way through cutting the slots in the second set of dividers I realized that I’d picked up the wrong off cut to lay out the the spaces. 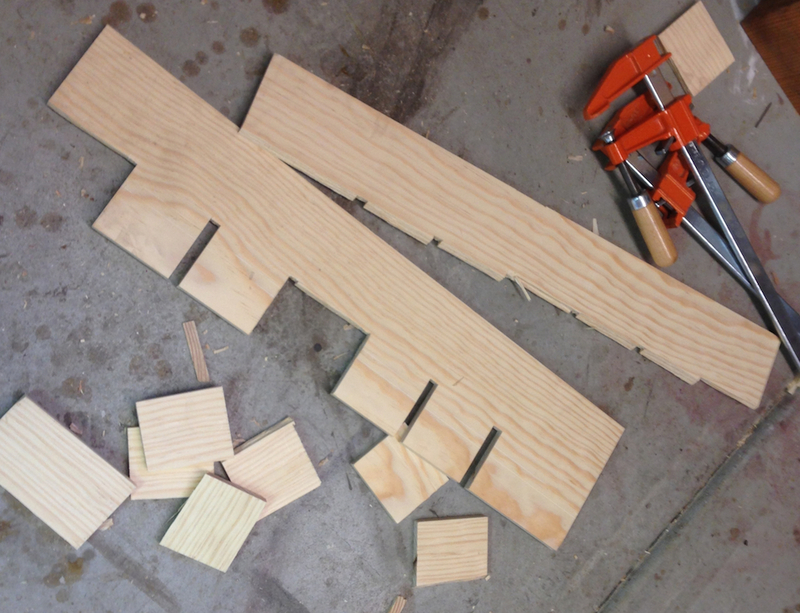 I was using an off cut from the slightly-thicker vertical dividers instead of the correct-thickness horizontal dividers – .375″, in case you’re interested. I should have been more interested. So, rewind again. 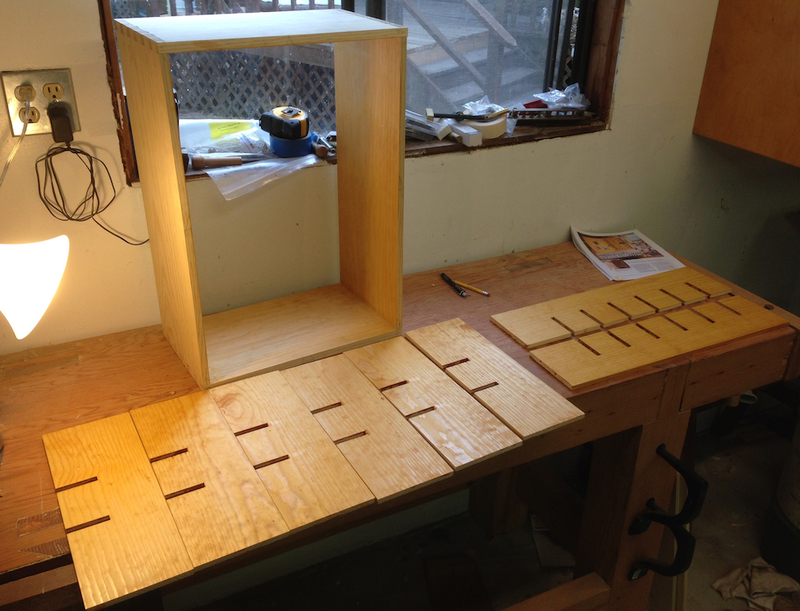 I machined up another pair of vertical dividers and used the correct bit of scrap to do my layout. Third time lucky, as they say. (I don’t know who “they” are, but I wish it was “nailed it on the first try” instead). This time it worked out OK. I padded on a couple of coats of orange shellac and left it to dry while I grabbed lunch. In case you’re following along with the plans, I made the dividers 5.5″ wide instead or 6″ as called out in the article, so I could get two parts out of each 1 x 12. I don’t think it will have any serious impact on the function. I started all of the notches at the same time — if they are a little tight anywhere and you do them one at a time is really easy to split off one of the tabs. If you work them all together at once, a little at a time, they all tend to support each other. I got the fit just about right, they slid together without much persuasion until the last little bit. I fit the dividers into the case carefully. I had to slightly pry the sides open as they were ever so slightly bowed in. Just finger pressure. I drove the dividers down until the horizontal bars were 8″ front-edge-to-back-of-case. I used the little layout gizmo from the article to mark where the ends of the dividers were on the outside of the case, and laid out pencil lines so I could drive in the nails to secure the dividers in the case. That worked really well too. The “layout gizmo”, slide it over the carcase side, align with each divider and mark the outside of the case. I also pined each of the interactions with my 23 gauge pin nailer. That worked really well, and it really tightened the divider up nicely. I flushed the ends of the dovetails with a plane and sanded the outside of the case with 220, then I was out of both time and wood. Tomorrow I’ll pad on a coat of shellac on the outside of the case and make up the panels for the back, then start fitting the “crate” framework. Dovetail Glamor Shot. Not perfect, but not terrible either. 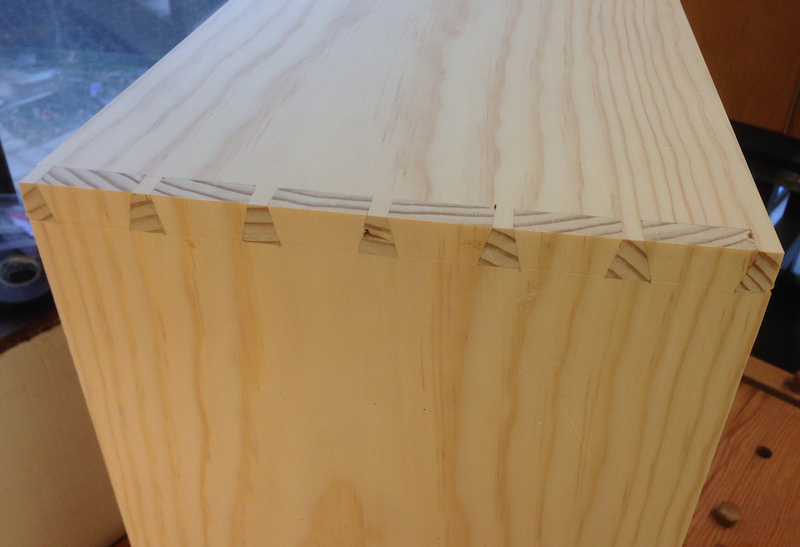 I think your dovetails look awesome. 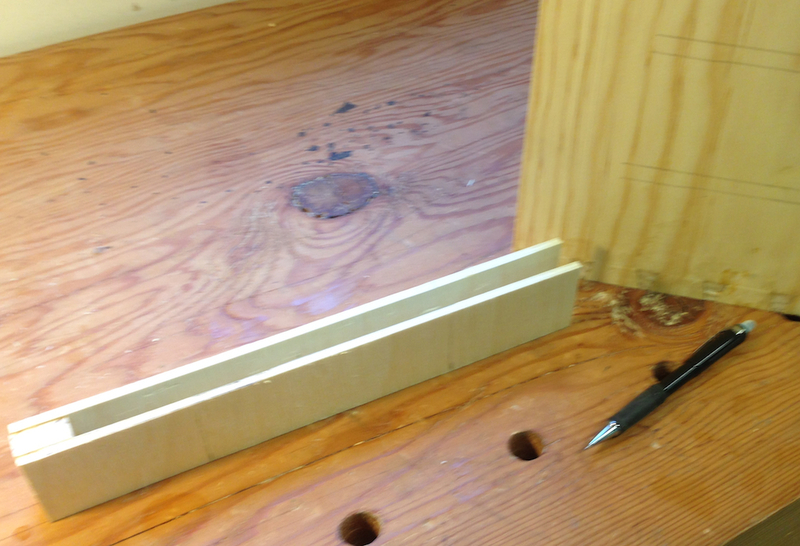 Did you toe nail the dividers with the pin nailer? This looks like an awesome fun project. Yes, I used my pin nailer to toe nail the dividers and on the outside. I wanted to use cut nails on the outside, but didn’t have the right length. Now that I think about it, I don’t have the right nails for the “crate strips” either. Dang it. I need to order a bunch of cut nails to fill up my cabinet I guess. It’s a fun project. I’m on the fence between using bin pulls and knobs like the original or card catalog pulls for practicality. it’s looking really nice. Did you have any problems getting the egg crate dividers together after you had shellaced them? I can imagine the nightmare they would be applying shellac after they were together. Thanks Jeff! You should see some of the ones I’ve made in the past, yuk! 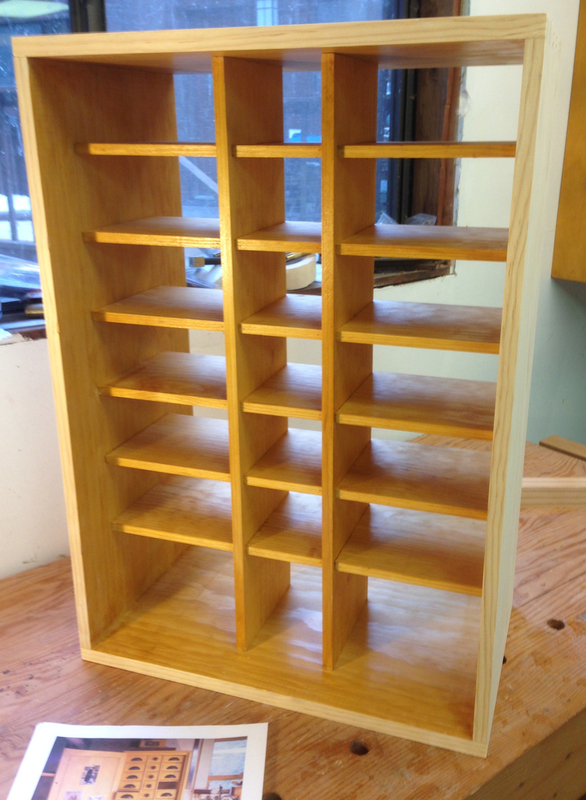 Very nice job, and your dovetails look great. Do you have any worries about shellacking the inside of the box? From my experience, if you shellac where the drawers go, and shellac the draws, there is a good chance everything might stick. Thats why the insides were left bare on antiques, not to mention saving materials and money on something that wont be seen. Very impressive and informative. I do have a question, sorry, just trying to learn. You state “I also pined each of the interactions with my 23 gauge pin nailer.” Can you clarify this for me? Where exactly did you place the nail? Did you nail from the front, rear, or in the middle? To nail in the middle, I don’t see how you could get the pin nailer in there except for the top and bottom board. So I assume that you must have hit it from the front and back and nailed in at an angle. Said differently, I put a nail in from the outside edge of the door frame so that in intersects the mitered joint at each corner. 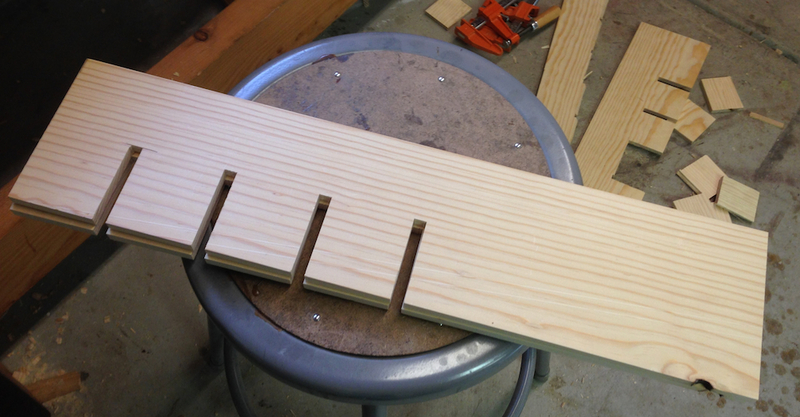 Actually I pinned the dividers too — same approach, essentially toenailing them from the edge.